I am so grateful and honored to be invited to offer a guest sermon here at Lyndale UCC. and enough open and loving hearts. 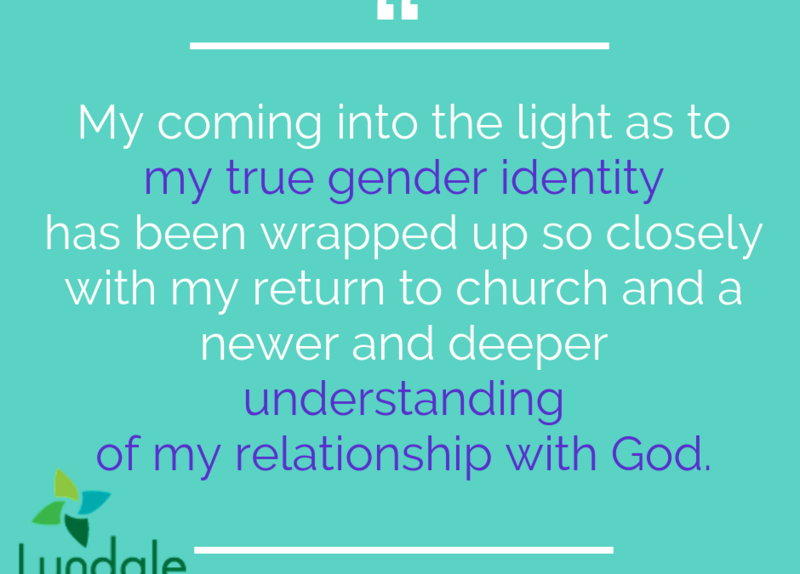 My story is both like and unlike those of other Trans people and Trans Christians. teacher thought I was just clowning around. “Get over there!” So, I hurried over to the boys’ line. the face of an uncaring world — I simply sorted myself out the way that felt most natural to me. gender identity, or who know with certainty that the gender they have been assigned is not correct. mean. There was no language available to me to sort through what I thought I knew about myself. to explore and attempt to figure myself out. me, of course. But the reason they hurt was because I knew the kinds intended them to be hurtful. did, or so I imagine. I knew I was a girl. clearly female directed. I now identify as a queer woman of Transgender experience. could hide more safely in the camouflage of masculinity. zone of absence, and it led to decades of melancholy, sometimes edging into despair. of my relationship with God. as a child of God, as myself, by my fellow Christians, was so very important. It was crucial. confusion are found. I know that many people have issues with their bodies, for all sorts of reasons. and the stakes grow to be enormously high. won only at great cost, Betty’s difficulties in understanding what I was saying are quite understandable. time and effort to replace such images and memories with something more up-to-date and authentic. they become one flesh.” There’s the conventional Biblical nuclear family, in all its particulars. That encoding became instrumental in disguising difference and enforcing conventionality. Greek, slave or free, male and female — instead, we are all one in Christ Jesus. hymn is played and sung, I feel myself caught up in that process of divine call and human response. name. God sees me, Melissa, the real me. on the lakeshore, to go search with Jesus for those other seas. Melissa is my first cousin and I am so happy for her!!! Though I was not present for your service, I heard your entire sermon read to me by the computer. Thank you for taking time to share not a position, but an experience from which we can all learn. As Neil Diamond sang….Except for the names and a few other changes, the story’s the same one….I so wish I could have heard this in person. We have both walked very difficult yet very parallel paths. I to did “the things boys/men did” mostly to self-crush the thoughts that did not fit with the way thing were supposed to be. I married my high school sweetheart and lived too long present but not present focusing my energy to fight /deny my gender issues. I reached my personal low in 2002 and thought my only recourse was to end my life. A very wise suicide hotline staffer pulled me back from the edge and pointed me in a direction of seeking therapy….maybe equal to your library. Since then, I came out to my wife after 24 1/2 years of marriage, worked through 50 years of issues to understand my true authentic self. I transitioned in 2006. As I first started working thru my issues, I thought being trans was a curse and would not wish this pain on anyone. Now I am more than happy…I choose to say I am at peace..God has given me the gift of being transgender. My wife and I just celebrated 40 years of marriage, have 2 wonderful accepting children and 4 grandchildren. I think we are stronger together now that this gender identity barrier has come done. Thank you for your beautiful sermon and being your true self.